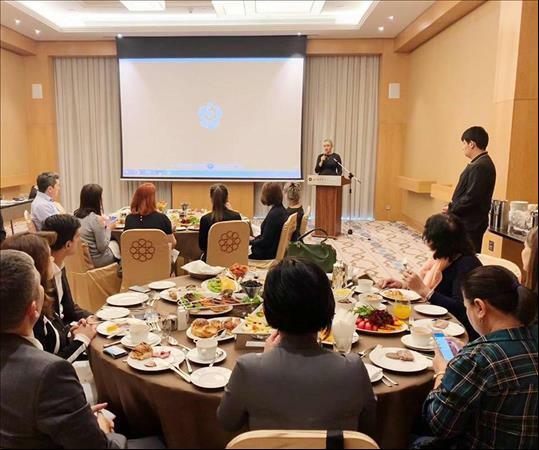 On November 2, 2018, First Class Hospitality Company held a business breakfast at the Hyatt Regency Tashkent hotel with top travel agencies of Uzbekistan dedicated to the presentation of the Ukrainian luxury hotel Edem Resort & Medical Spa. The presentation of Edem Resort & Medical Spa is a story about the unique resort that receives tourists from all over the world in one of the most beautiful parts of Ukraine, Lviv. On the territory of Edem Resort Medical & SPA there is a Health Recovery Center. It offers longevity, recovery and detoxification programs: Detox, Re-energy, Anti-stress SPA Weekend, Fithealth. The speakers at the meeting were representatives of Edem Resort & Medical Spa - Evelina Trinchuk and Aleksey Bashkirtsev, and a representative of First Class Hospitality. This event was organized with the support of Avrud Travel. First Class Hospitality (FCH) is the first and only PR&Marketing agency that offers representative services for hotels, tourist regions and DMC in Azerbaijan, as well as in the countries of Central Asia. First Class Hospitality is currently a member of the group of companies Prime Management & Consulting and the exclusive representative of the Edem Resort & Medical Spa in Azerbaijan and the region.